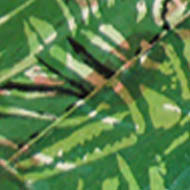 Silk Painting Techniques Using Fabric Dyes by Tropical Artist. 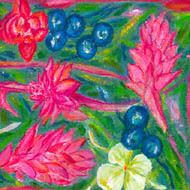 Silk painting techniques vary for silk scarf painting, wraps and one-off fabric lengths. 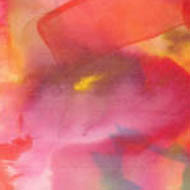 A variety of silk painting techniques is used when embarking on a silk fabric painting, much the same as when beginning any painting. 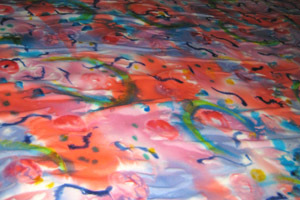 Instead of canvas, paper and paint, one paints with fabric dye onto stretched silk, using various methods. 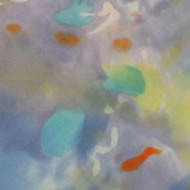 It is not unlike painting with watercolours onto paper in that "washes" of dye run across the silk and can be overdyed after being chemically set. 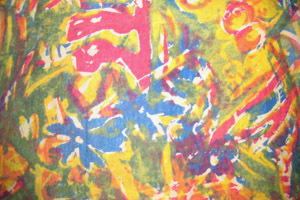 Fabric dye may also be mixed with a medium, such as sodium alginate, to produce a thick paste, which may then be screen-printed onto the surface or painted with a brush, like acrylic paint; this silk painting technique is not widely known. Most silk painters stretch the silk on a frame, outline a design or image with a water-resistant barrier (gutta) and then "colour in" the design with various dyes, which then require chemical or steam fixing. 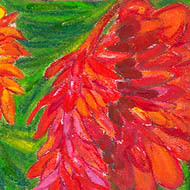 I rarely work that way, preferring to use a more spontaneous, painterly silk painting technique. Frequently, I work with no set idea of how the piece will turn out, but with broad concepts and a feeling about the subject matter. I work standing up at my printing table, which is about the same height as a kitchen bench, so quite comfortable. I work fast, from all directions, expending a fair bit of energy, which results in the design achieving a sense of movement and repetition of marks and colours. 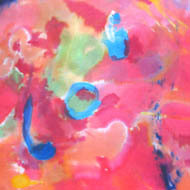 So I don't know if you could call it a silk painting technique as sometimes the materials used are merely incidental to the artwork. 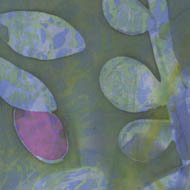 Quite often I also use a silkscreen to print images previously blocked onto it with wax, emulsion or film. For an impromptu result I might mask off sections of the screen and block it with stencils cut from newspaper or even an actual spray of leaves, depending on the effect that I want. 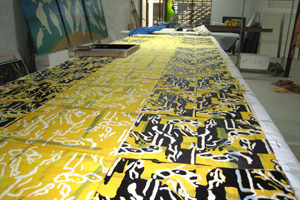 If I am printing an overall repeat design, then I need to be more disciplined and work out a system so that subsequent colours will register in the right spot. 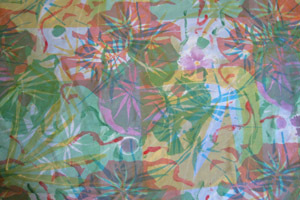 The use of gutta is a common silk painting technique, used when painting on silk to outline an image or to prevent colours from running into each other, but often I just use it for line and movement. Silk is a natural, protein, filament fibre, not unlike your hair. Did you keep silkworms as a child as I did? If so you will remember those industrious little creatures eating away at their mulberry leaves (and sometimes grape vine leaves for a pink instead of yellowish silk). Did you then spend hours winding the silk onto a cotton reel? If the chrysalis had been left to emerge as a moth it would have eaten its way through the cocoon, leaving a large hole and cutting the thread into tiny pieces. In China and India, where much silk is grown commercially (mostly using the bombyx mori moth), the cocoons, once completed, are immersed in boiling water so this doesn't happen. Selected pupae are allowed to turn into moths for breeding purposes. 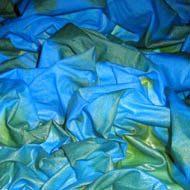 The properties of silk, which make it so popular, include its soft lustre, caused by its triangular cross-section. The silk worm extrudes sericen through a slit in its mouth, so, a little like a biscuit or icing pump, the shape of the resultant fibre is similar to the gap in the worm's mouth. 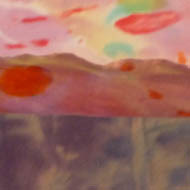 Once unwound from the cocoon and twisted in strands, the surfaces of the silk reflect light in ever-changing ways. 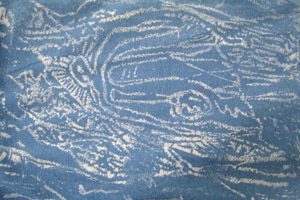 Once woven it is a glamorous fabric, long wearing, with excellent wash and light fastness properties. 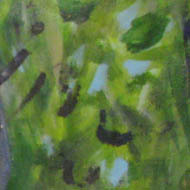 Silk also has low conductivity properties, making it warm in Winter. 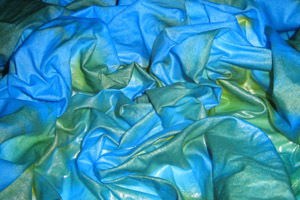 In Summer its water absorbent characteristics mean that it is cool - an almost perfect fabric! For many years I have been searching for a woven silk-cotton mixture fabric which would be suitable for dress or shirt fabrics in a hot climate. In 2008 I found Daisy, a lovely lady who lives in Sichuan Province, in China. Daisy was able to send me smallish quantities of exceptionally beautiful 50/50 habotai woven silk/cotton. Fortunately, Daisy and her colleagues and family survived the recent earthquakes so she is still able to send me fabric for silk painting and printing. I am so happy about this (and relieved at Daisy's continued safety of course!) 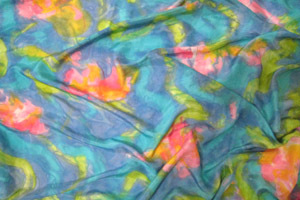 as the fabric is perfect for clothing in a hot climate like Tropical Australia - or for Summer anywhere. The hygroscopic qualities of natural cotton as well as its strength, wash and light fastness make it a perfect partner for combining with silk. 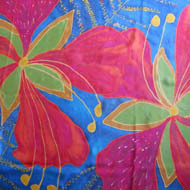 The handle of the silk/cotton fabric is soft but crisp and it drapes beautifully. 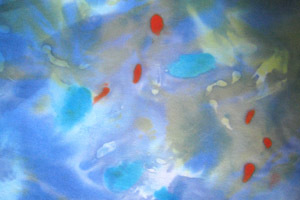 The dyes that I use for painting on silk are compatible with both silk and cotton. They belong to the fibre reactive class of dyes and are fixed with a mildly alkaline chemical (sodium bi-carbonate or sodium silicate). 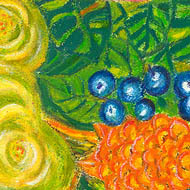 There is little residue or wastage so it is reasonably environmentally friendly. Although I like the idea of using natural dyes, on the whole they are not light or wash fast - so it's a bit pointless when my work is mainly about colour! Natural indigo is an exception to this and reasonable results can also be obtained with saffron and cochineal as well as tannin (tea) and rust. 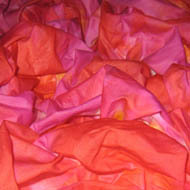 If you are reading this and would like share your favourite tried-and-true natural dye recipe or silk painting technique please go to YOUR pages and share?